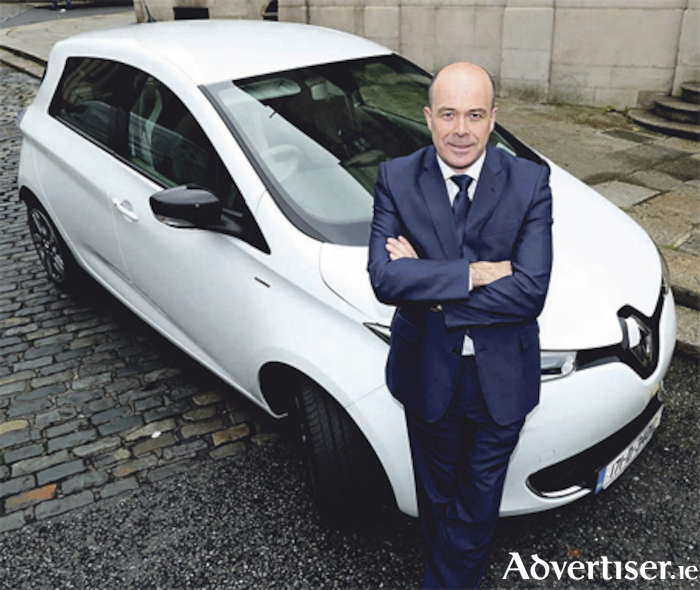 Roscommon-Galway TD and Minister for Communications, Climate Action and Environment, Denis Naughten, is hitting the road in the new 100 per cent electric Renault ZOE ZE 40 this week. The Minister will test drive the ZOE as he travels to engagements and meetings in the course of his normal working week, including between his constituency of Roscommon-Galway and Dáil Eireann in Dublin. The Renault ZOE ZE 40 has the longest range of any mainstream electric vehicle, 400km in NEDC tests, which Renault estimates at up to 300km in real-world driving, meaning the Minister can travel from Dublin to Roscommon and around Dublin city without any so-called ‘range anxiety’. In Budget 2018, Minister Naughten’s department announced funding of €10 million to incentivise the use of electric vehicles (EVs ), and new grants to continue to support the installation of home-charge points will be available from January 1 for new and second-hand electric cars. There will also be a 0% rate of Benefit in Kind for EVs for one year as an interim measure while a BIK review on vehicles takes place, and additional funding will be provided to support the provision of public charging with an increase on the number of rapid chargers available. Minister Naughten will be driving the Signature Nav version of the new Renault ZOE in pearl white, complete with built-in sat nav and BOSE 3D sound system. Patrick Magee, country operations manager with Renault Ireland, said: “We are delighted with the provisions for electric cars made by Minister Naughten and the Department of Communications, Climate Action and Environment in Budget 2018.